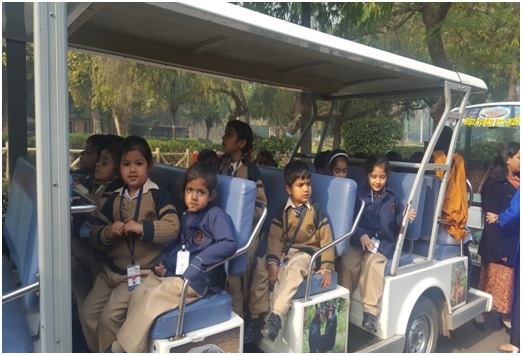 An educational trip to the National Zoological Park was organized for the students of class Pre-School. The children embarked on the journey to the zoo on a peppy and excited note. The students enthusiastically spotted the majestic animals and birds like Asiatic Lion, White Tiger, Royal Bengal tiger, ostrich, pelicans and elephants basking in the winter morning sun. They had a wonderful time watching giraffes, tigers, jaguars, elephants, migratory birds and much more. The ‘Joy Ride’ in the battery operated trolleys brought about squeals of laughter and joy. The National Zoological Park has more than 2000 species of birds and animals living in an environment that in many ways resembles their natural habitat. Children learnt a lot about the animal kingdom and their importance. Overall it was a day well spent which gave our tiny tots wonderful memories to cherish forever.